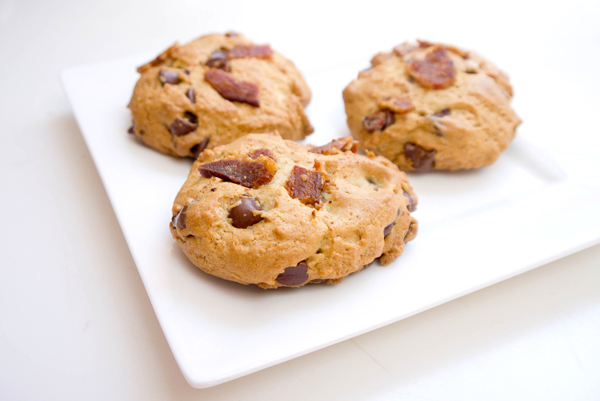 You might think bacon doesn’t belong anywhere near chocolate chip cookies, but that is where you are wrong. I discovered a friend loves bacon – and that it was her birthday – and wanted to make something that celebrated both. After asking the all-mighty Twittershpere for assistance, I was directed to a recipe for chocolate chip cookies sprinkled with crisp bacon. So, yeah, I can’t take any sort of ownership over this idea, but I did put together my own recipe to showcase that wonderful bacon flavor mixed together with the sweet chocolate of the cookies. And, with the Fourth of July just around the corner, I know you are all searching for patriotic desserts to take to picnics, parties, and gatherings. What’s more American than bacon and chocolate chip cookies? Not much. Sure, these cookies aren’t red, white, and blue, but they are seriously tasty. Start by baking your bacon. That’s right – why make a big mess of your kitchen when your bacon can easily (and less messily) be prepared in your oven. Line a sheet pan with tinfoil, place five to six strips of bacon flat on the pan, and then pop into a hot 425 F oven. Flip after about 7 to 10-minutes. Once your bacon is baked to your happiness, let rest on a few pieces of paper towel. Lower the temp of your oven to 375 F so it’s nice and ready for your cookies. Blend together the butter, oil, sugars, and salt. Add the eggs and vanilla and whip until smooth. Sprinkle in the baking soda and then gradually add the flour until the cookie dough comes together. Toss in the chocolate chips and get ready for making cookies! Remove the bacon-fat laden sheet of tinfoil from your sheet pan and then spoon the cookie dough on the pan, leaving a bit of space between each cookie. Now crumble the bacon and gently smoosh about a 1/4 teaspoon of bacon bits on the top of each cookie. Pop the bacon chocolate chip cookies into the oven for 12 to 14-minutes. If you prefer a crisper cookie, let them hang out in the oven for 15 to 17-minutes.